This is our new Worship Warrior group for this year- we are looking forward to working together to make sure that God and Jesus are always at the centre of everything we do in our school. Last week we organised a cake sale to raise money to buy a prayer wall for the hall. It was a fantastic day- children and staff visited the sale during the day. In our open afternoon our families came and bought cakes too! We raised over £200! We have now ordered a beautiful prayer wall which is being especially made in our school colours. This will be delivered in the New Year as the lady makes them by hand! Our worship warrior group will be deciding how we want to spend the rest of the money to help worship in our school. Thank you to everyone who sent cakes in and bought cakes! Look at our bible time line day photos! We had a great time and finished with a special worship time. One of our first jobs as Worship Warriors this year was to help Mrs Cooper and Mrs Edward organise our bible time line day. We love bible stories and the lessons that we learn but we are not always sure which bit of the bible they are from. Now we have our own time lines we will get better at doing this! We are utterly thrilled with our new after school Club - Worship Warriors. 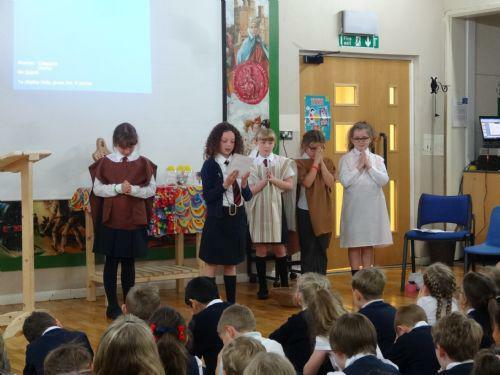 These mighty Year Five Children are learning how to present Worship to the whole school and we have really enjoyed the fruits of their labour with a fabulous assembly about Gideon. We are so proud of our Year 5 Worship Warrior team who provide an amazing assembly for the whole school every week. So far we have had heard about Naman, Ruth and The foolish builder.